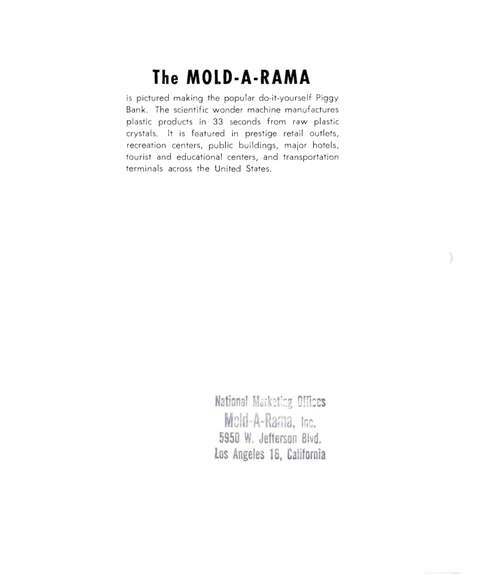 Mold-A-Rama Sales info and old news items. Thanks to Jim Irwin we have this REALLY COOL newspaper clipping to share. The following photo, letter, business card, (and an operations manual that's now located here) were my first big Mold-A-Rama find on eBay back in 98-99-ish! 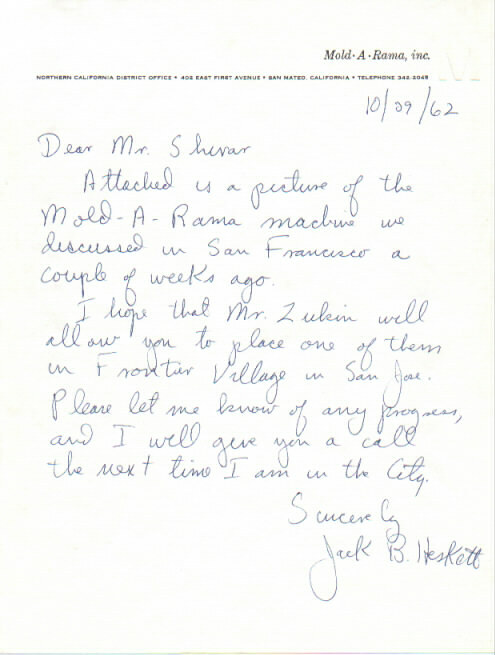 In the following letter you can see the salesman Jack B. Heskett is pitching the machine to a now defunct amusement park for operation. Here's a link to the Defunct Amusement Parks page about this particular park. Here is a fansite as well. 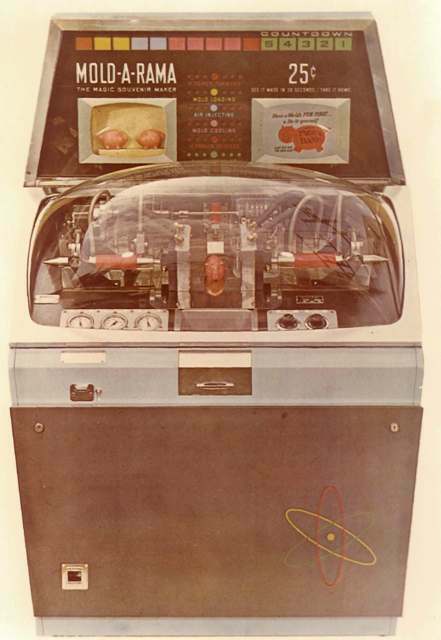 Over the years I've inquired of many people as to whether the machine in the photo above was in fact ever on location. 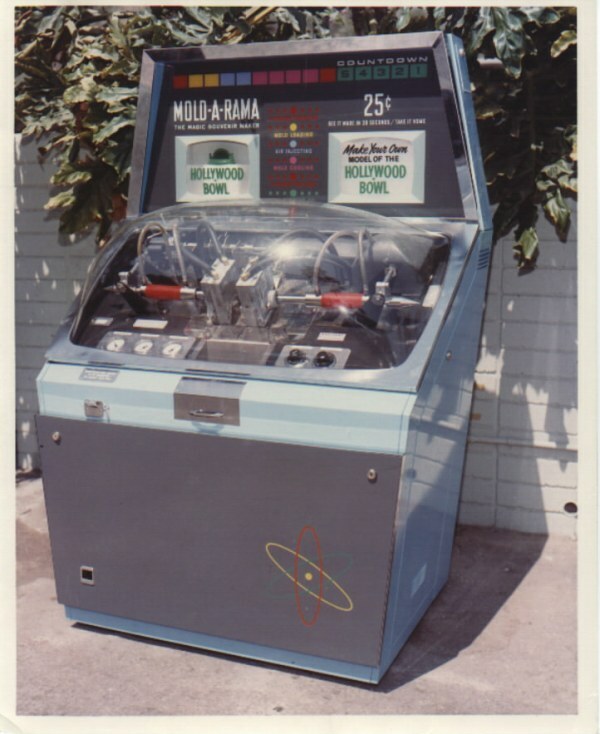 This included exchanging some emails with the Hollywood Bowl museum, but the current staff were unaware of there ever being a machine on location there. Finally in 2004 I came across the Hollywood Bowl mold in the photo below; and only recently did Tom Irwin confirm this fact "The Hollywood bowl machine was in an enclosure just deep enough for the machine with a roll up door that got closed every night, except for concert nights. It was across from and facing the gift shop. Best regards, Tom"
Big thanks again for this info Tom! 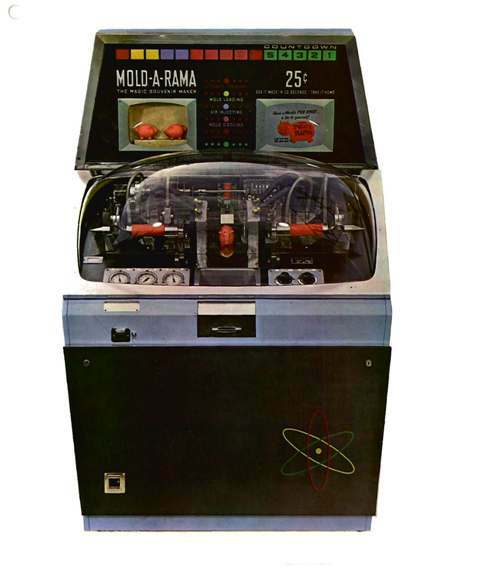 This next news article and accompanying two photos are part of the only professionally produced original sales ad/slick I've ever come across for a Mold-A-Rama. When I purchased it I quizzed the seller on their knowledge of its history.... "noticed your other question. I bought a whole group of items from a man who must have thought about starting an amusement park or something. because he had just a whole bunch of papers like this. I think it was in the late 1950s.he was from the Gettysburg area and I think that's where he was contemplating starting the business. but he apparently didn't, because I never heard of one there, except for one that was there a lot earlier than the '60s. 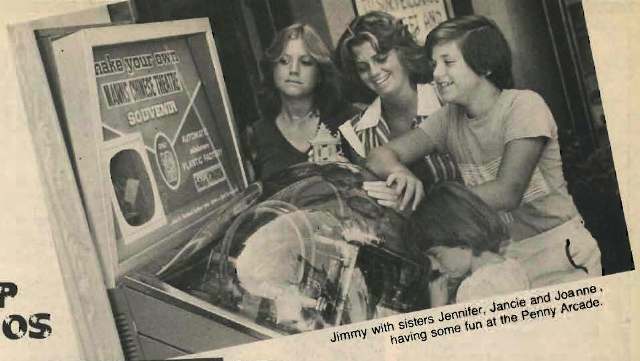 This one is an odd and luckily find from a Teen Beat back in February 1978 of Jimmy Baio. The machine is at Mann's Chinese Theatre and it appears to be the pagoda one. (I'm sure more unfound items like this out there!!!) 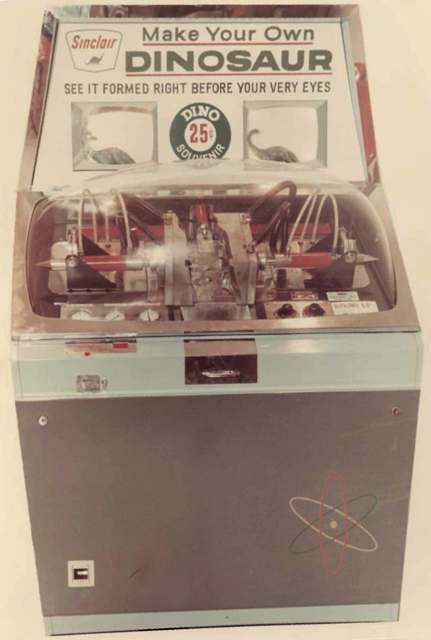 And Tom Irwin was again able to share some information about them... "The Chinese theater machines were inside the courtyard, one on the right and one on the left as you walked into the courtyard, facing the theater itself. They were next to the courtyard facing doors for the 2 souvenir shops. *You can see them in some older movies and TV shows, The pagoda product was on the set of General Hospital for awhile during the series period of Luke and Laura's wedding and afterwards on their fireplace mantle (there may have been a scene of them making it on their honeymoon, I remember them using the courtyard for shooting a scene)." Thanks again Tom! That's all I have for now, you may return to the main page via this handy link.